•snoozies!® are not socks and they're not slippers - sort of a crossover between the two and that's why we call them "foot coverings"! 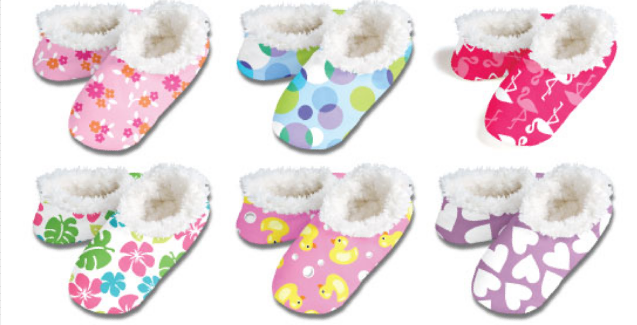 •snoozies!® are made with a brushed fleece exterior in colorful & fun printed patterns and then lined with a soft Sherpa fleece inside. •snoozies!® are soft, comfy, warm and just simply adorable - the newest foot coverings for your feet! •Each pair has a non skid sole so you can feel safe wearing them on wood or tile floors. 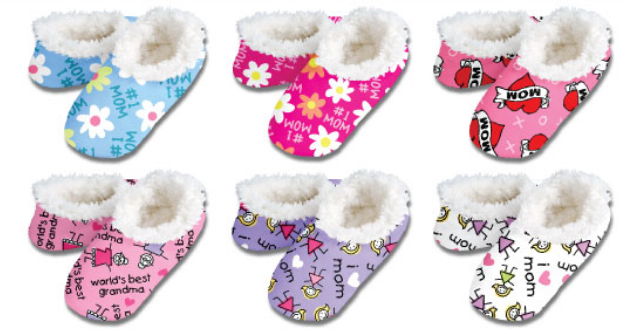 •snoozies!® keep feet warm even on the coldest of days! They work in warm climates too where air conditioning keeps floors cold. •snoozies!® are fully machine washable and won't shrink! •snoozies!® come in sizes for teens, women, men, and children. We have a old colonial house, full of wood floors. While they're beautiful and charming to look at, they're not fun to walk on, or a great source of warm cozy cushioned comfort beneath one's feet in the Winter. As such, I'm always on the lookout for comfortable slippers that will provide both warmth and comfort, without adding too much bulk. A perfect cross between a sock and a slipper, snoozies are the solution! The height of a low rise sock, and lined with gloriously SOFT Sherpa, snoozies, are the perfect remedy for tired cold tootsies (and did I mention they're machine washable?!). The plethora of adorable patterns, make me want to go on a snoozies shopping spree, so that I can have a cute pair on hand for every day of the week! Super comfortable and adorable, snoozies make the perfect gift for EVERY occasion!